It’s here! It’s here! 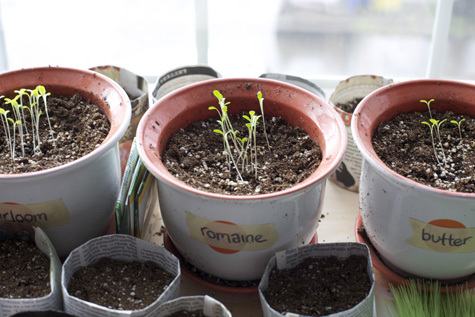 Gardening season has crept up on us, and the window for starting seedlings is quickly slipping away. But don’t despair, ’cause it’s certainly not gone yet! With a spirited baby boy keeping me occupied all through the days, I’ve been doing my pre-gardening in those sacred quiet hours of the very late night. Sort of strange to be planting by moonlight, but it seems rather magical and romantic. A midnight garden witch? Sure, I’ll take it! Last year may have been micro, but this year I’m going BIG. We’ve remodeled our backyard and built 4 giant raised beds. Plus the patio potted plants, the new potato project, and a couple of other fun little ideas I’ve got in mind . . . it’s going to be an epic season! It started with Damian building me an impromptu potting table in our living room, under the south-facing window. A few late-night sessions of paper folding, and I was ready to start my seeds. 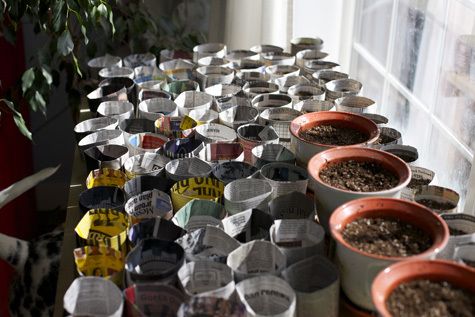 Oh how I *heart* little newspaper seed pots. And boy howdy, do I have a plan for these babies! 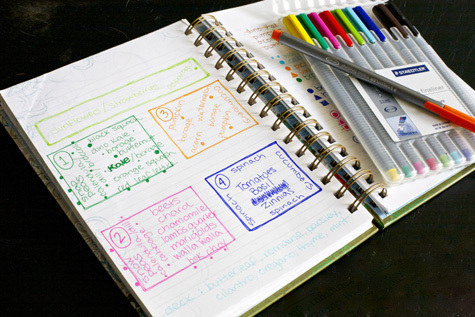 Color coded, drawn up and plotted out, meticulously organized. Because I am crazy . . . and that’s my idea of a good time! 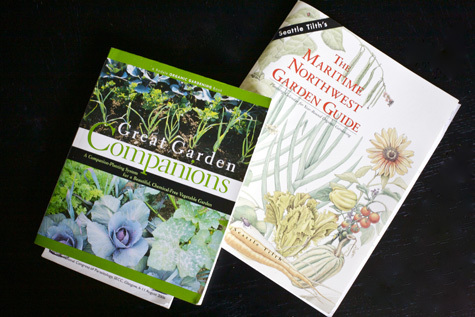 I have two resources that I find invaluable: Great Garden Companions by Sally Jean Cunningham, and The Maritime Northwest Garden Guide. My bibles. Great Garden Companions is a fabulous introduction to the concept of companion planting. It’s packed full of information (I’ve read it cover to cover) but also has a bunch of super simple charts and guides, for easy reference. Highly recommended! The other manual is, obviously, specific to my region. But I bet if you check your local nursery, there’ll be something similar for wherever it is that you live. These are the best, because they tell you exactly when to do what, for everything. Very handy! 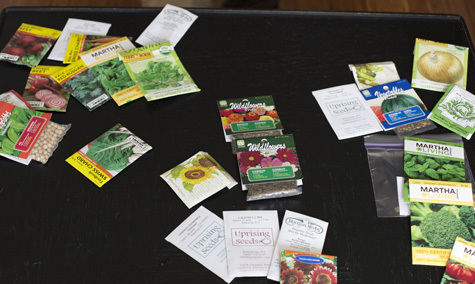 Sorting through all the seeds . . . so many packets this year, makes me feel like a kid in a candy store! And of course, Waits and Harley wanted to help. Now it’s just the waiting game. Well, waiting and watering. Grow little guys, grow! How are your gardens coming along? Are you planning anything new this season? What are you growing? For once, I started seeds on time this year. We now have flats of lettuce, squash, and more tomatoes then I will ever be able to plant. Not to mention, some good looking starts for the hottest of hot peppers. It’s going to be a fun garden this year! I’m also anxiously waiting to get my garden in. This is the first year we’re starting all our plants by seed and I’m really enjoying the whole process. New things I’m growing this year are celery and kale. Looks like your plans are all laid out, but maybe you’d like to use this for next year http://www.growveg.com I started planning out my garden with it yesterday and found it very helpful with companion planting and other basic info. We just planted our lettuces and kale this weekend! :) is that a baltic amber teething necklace on your son? Just bought one for my daughter! Does it seem to help? YAY for a garden! I also have a table in our dining room full of plants waiting to go into the ground. Looks like you have some terrific help this year! Totally excited! This is just our second season growing and it is already better than the first, trial, season. We wanted to start by seed, but spring crept up on us so we are starting with seedlings this year. It is a steep learning curve when you have never done it before! I’m growing pretty much everything except tropical plants! It’s crazy. (I ramble about it in detail on my blog so I won’t rehash it here). I’m transforming my old herb garden into a tea garden and designing a succulent garden and a butterfly garden for Nina…very exciting times on the farm. I can’t believe I was living in the heart of Chicago less than three years ago. Zoiks! That’s about all that matters until the seeds sprout. Most seeds will even germinate on wet napkin in the compete dark. That’s helpful, Gabriel. Thanks so much! On a totally unrelated note-I think about veganism alot lately, like every time I open the milk carton I get a little pang of guilt. Probably not healthy, but it’s present nontheless. So this morning while I applied my dog’s flea prevention-the nasty stuff that seeps into his blood stream and kills any bug that bites him-I wondered what you do for flea prevention for your dogs. I swear every time I put it on him, he looks at me with this super sad face, bcause I feel like I’m basically poisoning my sweet baby! Oh man. My seeds are crap this year. We make all of our own hot sauce and canned peppers, stuff like that, and my habaneros are just not happening. 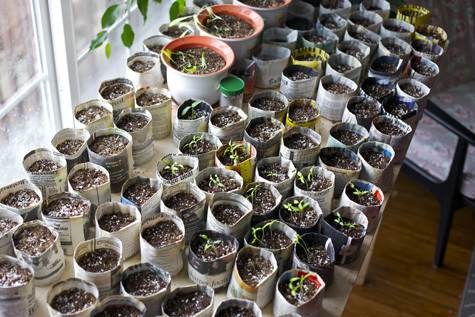 I have to start over with those and they take FOREVER to germinate anyway. My romaines died because of weird weather and probably other user error reasons. Cucumbers are being stupid. Just a sad seed start so far. I absolutely LOVE this time of year! Being in the garden makes me so happy and I love exposing my little man to the joys of dirt. It is so exciting watching everything spout and grow and then reaping the benefits of fresh food. I’m in an apartment and have no actual outside planting space or balcony! Can anyone guide me to some really good books/websites for more info on having an indoor garden? I have a shared porch I can put them out on for some fresh air… i really want to grow something! My (50) peas are almost knee high, I have cute little sprouts all through my first bed – beets, arugula, chard, lettuce, kale, radishes (OMG radish and tarragon ‘butter’ sandwiches!!! ), carrots, and spinach. I just planted half of my tomatoes. I decided to skip the eggplant and peppers this year in favor of MORE TOMATOES!!! We’re actually getting a real yield out of my asparagus this year, the blueberries and raspberries are flowering, the grape is leafing out, there are tiny little nectarines and cherries and plums. No flowers on the apple still. The fig is waking up, and I just picked 3 crates of navel oranges because the tree is starting to blossom. And you should SEE my strawberries! Like a million tiny flowers. We’re going to be putting in zucchini and pumpkins and butternut squash still, there are plans for a pomegranate tree this winter. I LOVE my garden. I’m decided to triumph this year! I am set no so much in growing a spectacular garden, but in growing something (anything, really) that won’t die! I’m trying luck with almost random stuff… cherry tomatoes, cilantro, radishes and habaneros (they do well whole year round in the peninsula, so if I kill these, that’s when I’ll know I was not made for gardening). I love hearing about everybody’s garden endeavors, from the smallest sweetest little first-time windowsill plots, to the giant spreads that make me do the jealous dance. Love that there’s such a range! Also some really great tips, so thanks everyone. It’s so nice that you guys read the comments and troubleshoot for each other. Yay community! Also, that GrowVeg site looks sooo fun, I think I’ll be spending some serious time there, muahaha. 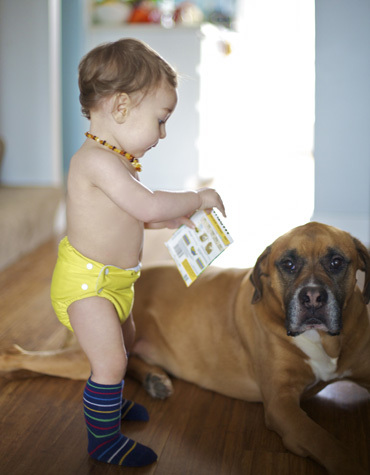 @ Meredith – We don’t normally do anything for fleas. The dogs have never had a problem with them so it’s always been a non-issue, except once. When new neighbors moved in with new dogs, we suddenly had a flea problem. I looked into various natural remedies but it was when Waits was really little and I didn’t want to risk it getting out of control. I eventually did Frontline or Advantage or one of those nasty things. Luckily it took care of it and I haven’t had to deal with it again. If it were an ongoing issue, I would try Cedarcide. As far as it being a vegan issue, I see it like this: if a lion or a bear or any large carnivore were attacking me, I wouldn’t be concerning myself with the vegan-ness of protecting myself. I would fight back! So for me, same goes for a miniature attacker. Self defense is valid. @ erosan – Oh, those dang radishes again. LUCK! @Sayward: aye, those radishes. Hopefully, this time around they will grow larger than my pinky’s fingernail. This year: potatoes, runner beans, tomatoes, pak choi, carrots, courgettes, broccolini, parsley, mint and strawberries. I am bursting at the seams with happiness just thinking about it, and so excited to read of everyone else’s projects! We also have some apple trees, pear trees and fig trees (although UK weather never results in ripe figs). Oh and a cherry tree, but the birds and squirrels always get to it first, grrr. Yes this is a great community here! Thanks for the tips Kelly M and Lauren! Thanks for letting me know about swaddlebees, they seem pretty cool. Can’t wait for more garden updates everyone! My first thought when seeing your potting table was, “well, clearly you DON’T have cats” LOL. We have one of those cool extended-shelf-kitchen window dealios and I had hubby make a me a screen that fits right in. Otherwise the silly fuzzbuckets climb up there and eat any sprouts but mostly just dig up all the potting soil and dump everything over the kitchen sink. Pssshh. They are always trying to sneak outside and eat green things or roll in the dirt like chickens. I do grow pet grass for them. @Meredith (and anyone else) on the flea deal… fortunately we haven’t had to deal with fleas with our two dogs, but there are a lot of natural things you can try. If you want to take care of carpeting you can sprinkle borax over everything, fleas don’t like garlic (although dogs can’t have it raw), you can make a rinse/shampoo for them with rosemary or something in it… yeah there’s lots of stuff I forget now. Also on the topic of wonderful borax… when the pesky sugar ants begin spring forays into your kitchen, just boil sugar, water and borax and set out for them away from pets. Works great… I forget the proportions I normally use but just Google it. Borax is the active ingredient in any ant killer anyways, but who needs something else to buy and who knows what else they put in that stuff. My husband built me a planting table. I am so proud of him. He built two saw horses from plans he found on the internet, except he made them a little taller. Then he put a piece of plywood on top. THEN he hung florescent lights from the ceiling. It looks so legit! I love it! I love the idea of your newspaper pots, but it is just not something I am willing to dedicate my time to doing. This year I bought peat pots, but next year I want to get a reusable planting tray. I just couldn’t find any locally and was to impatient to get planting to order them online this time! I have about a bazillion varieties of tomatoes, kale, peppers, cabbage, that fibinachi vegetable, and herbs started. I already planted lettuce outside, one batch about 3 weeks ago, and another variety two days ago. I will start my squashes/cucumbers in the next day or so. I’ve been spending lots of time preparing my yard for a garden. The previous owners didn’t do much in the yard, I don’t think. In January I put down cardboad, with leaves on top in two places to kill the grass for garden plots. On the south side of the house I’ve just been hand tilling because there wasn’t as much grass. (I had to dig up and transplant a bunch of bulbs there though) After I dig everything up I’ll put down a layer of coffee grounds and leaves, then a bunch of store bought cheap top soil. Our soil here is mostly clay. In future years I’ll have plenty of compost to work in, but for this year I’m just takin’ the easy way out. I ALSO planted three fruit trees; a 2-in-1 apple, 2-in-1 pear, and 2-in-1 cherry tree. And grapes! I have 3 muscadines and 3 seedless concords. Oh! And the rain barrel! The future tomato bed on the south side of the house always got super swampy! SO we put a rain barrel at the down spout. Amazing! No more swamp, and we have free water! A co-worker of Aaron gave us that rain barrel, now we are going to make some more from barrels that the local Pepsi plant sells for $10. Woot! I’ve been trying to spend at least an hour a day in the yard. It can be tough, because we can’t really work the clay soil when it is wet or it’ll turn to bricks. SO YES I THINK I AM AS EXCITED AS YOU ARE!!! It helps that this is the first season that we have a YARD. Wooooooo! Oh, does anyone around here have any tips for squirrels? I guess we’re lucky that squirrels seem to be our biggest pest problem, but seriously, they are a pain! They dig up all of my bulbs, chomp on my strawberries and do dances on their plant-corpses, dig up bits of yucca root and spread them everywhere… not to mention the chewing on the house and invading my attic! BAH! I have a question. Do you just open the bottom of the paper planters and then put the whole thing in the ground paper and all? I love this idea and really want to try it next year. unfortunately I do not have a garden, but I have a BALCONY :-). I am a positive thinking creature, I think its better then just a window…. hopefully soon we will move houses, and I am having high hopes that the new place has a garden. @ Meghan – OMG, you’re excitement is palpable and it makes me SO HAPPY because I know how long you’ve been waiting and dreaming of this garden. I am just thrilled for you! And a little envious, as it sounds like you have a super fly set-up going on. Love the rain barrel! (and all the rest) CONGRATS! @ Kathryn – Supposedly you can just plant them as is, and it should biodegrade. But I find it’s so easy to just tease them open that I do it, just to make sure there’s no obstruction for the roots. YAY EVERYONE IT’S GARDEN SEASON!!!!!!!!!! @Meredith and everyone! A suggestion I have found for critters, meaning insects, is diatomaceous earth, or DE… NOT DEET! Diatomaceous Earth is fossilized algae, and pretty much dehydrates insects right thru their exoskeletons… My gf and I are having issues with ants inside, and found this out, but you can use it outside directly on plants… The stuff is FOOD GRADE and is harmless to humans and pets… Use it for fleas, ants, cockroaches, bedbugs (running rampant on the East Coast, YUCK! ), ticks… The stuff is amazing… I got mine at Whole Foods for 8 bucks. Ace didn’t carry it. I’m trying to get some of the more local (and not commercial) markets to carry it. Here are some other organic tips for various garden lurkers, including deer! Oi Sayward! I made your pots for my garden this year. (Absolutely the easiest thing and a great project when laid up on the couch sick.) My husband and I have absolutely NO CLUE what we are doing, we both have a black thumb. But I kept a house plant alive all year, so I’m saying “Why the hell not?” So we are endeavoring to grow a lovely assortment of tasty things. Tomats, radish, cucumbers very basic stuff. BUT, I’m having one issue. My mother said I’m not keeping my plants wet enough. And true to form, I have *NO* sprouts. I’m not totally downhearted as I haven’t even sown everything yet. I did a test run of two different kinds of herbs. But do you have any tips on how much/when to water? She suggested a canopy of plastic wrap with a rubber band to make a little hot house. What’cho think? @ Alley – hmm, I water every day but I think a lot of it depends on air temperature and humidity where you are. Seedlings do need to be well-watered, but it’s a fine line because you don’t want to drown them! I’ve never done the hothouse but it seems like it would work . . . though it may be a pita to remove it to water each day. No sprouts at all yet, huh? How often are you watering now?